Postcards were a fashionable and practical way of communication in the time before phones and social media. They were used in different ways – to wish a friend a happy birthday, to pass on information or just to keep in touch. Performers would send them out to agents in the hope of getting work and fans would search for the perfect card to add to a collection. There are many apologies on the backs of cards for failing to find the desired image and hopes expressed that the card sent will be enjoyed. Picture postcards could only be sent from 1894 and postcards sent previously could be devoted to writing only. The postal service was reliable, with more than one collection and delivery a day. This meant that arrangements could be made, changed or confirmed at short notice. A card of Marie Dainton sent to Miss Railton from Bridgend in 1905 tells her that Mother has arrived safely and that Mrs Gammon and Herbert was meeting us at the station. In February 1904 the same Marie Dainton sends a postcard to herself from herself for luck. She was appearing in the Chinese Honeymoon as Mrs Pineapple. Minnie writes to Mrs Locker on a card of Hetty King in 1906 to let her know that she is going on alright with her housekeeping and that Clare comes down to visit and she makes me the beds. Ethel Larder in Louth receives a card of Gertie Gitana which the writer, Florrie, bought at the Palace Theatre in Hull. She says Gertie was the star artist and the card was sold to support the Belgian relief fund. A card of a cycle act is sent with the stark message don’t forget to give our Willie the milk to bring up. There is no date, sender or recipient so it could have been left propped up on a mantelpiece or pushed through a letterbox. Perhaps Willie turned up with the milk before it was sent. Pansy Montague, known as La Milo, caused raised eyebrows by posing as a living statue covered in alabaster whitening with a few strategically placed pieces of white material. She took part in a parade in Coventry in 1907 as Lady Godiva which caused a great scandal, although an anonymous correspondent writing to Clara cannot see that there is much in the postcard to make a fuss about. He had enjoyed himself at the music hall the previous night. ‘M’ receives a card asking if she has ever tried the Halls. The writer suggests the picture is M in a bathing costume and encourages her to try the hand balance in the sea where it would be an attraction, although cold. Finally an all lady rifle act send out postcards to say they are ‘vacant’ October 27th and onwards (no year). Their permanent address is 29 Richmond Terrace, Clapham Road, London. 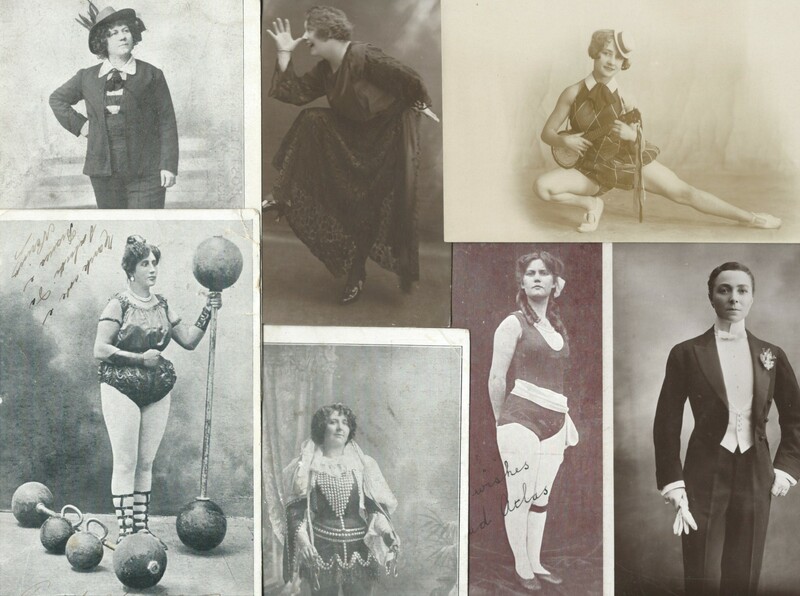 This entry was posted in Music Hall, Music hall artistes, Music hall postcards, Strong women and tagged Gertie Gitana, Hetty King, La Milo, Marie Dainton, Music hall postcards, Pansy Montague, rifle act, Strong women, The Edivictas on February 9, 2019 by Monomania.